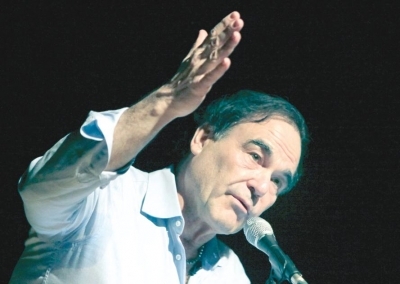 BANGKOK — Adolf Hitler was a psychopath and a monster but rose to power thanks to big-business leaders and other supporters who appreciated his vow to destroy communism and control workers, Hollywood filmmaker Oliver Stone says. Stone, who is working on a 10-part documentary on the 20th century titled The Secret History of the United States, said the German dictator was “enabled by Western bankers” and managed to “seduce” Germany’s military industrial complex. Stone was in Bangkok to give a lecture to high school students on the role of film in peace-building as part of a visit organised by the Vienna-based International Peace Foundation. He said the aim of his documentary, which two historians are helping him with, is to offer a fuller understanding of the 20th century and how some of those lessons may be relevant to President Barack Obama in 2010. “What has America become? How can we in America not learn frofrom Germany in the 1930s?” the Oscar-winning director asked. Earlier in the day, Stone told about 300 students that his 1991 movie JFK was his most controversial to date and that the U.S. remains in denial over the possibility that someone other than Lee Harvey Oswald could have assassinated John F. Kennedy. Stone said exploring alternative theories over the JFK assassination remains too sensitive for those in the media or academia who “would be endangering their careers and their position”. JFK ridicules the Warren Commission’s conclusion that Oswald acted alone and suggests a massive conspiracy. Stone’s film centered on a theory by New Orleans District Attorney Jim Garrison that a CIA-led mutiny killed the president and the plotters walked away unscathed. Garrison’s theories went to court in 1967, but Clay Shaw, the alleged “evil genius” behind the assassination, was acquitted. Stone said he thought it was “a good thing” to revisit the JFK ­assassination. But he came under fire from the historians and film reviewers who contended Stone had fudged facts, invented characters and elevated speculation to truth to support his belief that the killing was a high-level government conspiracy.